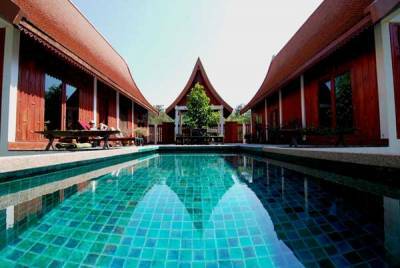 Our second Thai villa, Green Gecko, reflects traditional Thai architectural design, and equally enjoys a very private and peaceful setting in the Thai countryside. This Thai pool villa is centered around its own very private pool. Holidaymakers enjoying a family holiday in Thailand can relax to the utmost here, as daily breakfast, lunch and dinner are included - an excellent way to get to know Thai food. Many of the ingredients are grown organically on the grounds, from rice to fresh herbs and fruit and a wide variety of vegetables. Like our sister property, Green Gecko harvests rainwater, has a recycling programme, and is involved in reforestation of old rice paddies. The villa sleeps up to four guests on a full board basis. A Thai family of six, we have traditionally farmed rice in the countryside of Thailand's Udon Thani province, and now welcome visitors keen to see another side of Thailand to our private pool villas Gecko Villa and Green Gecko.